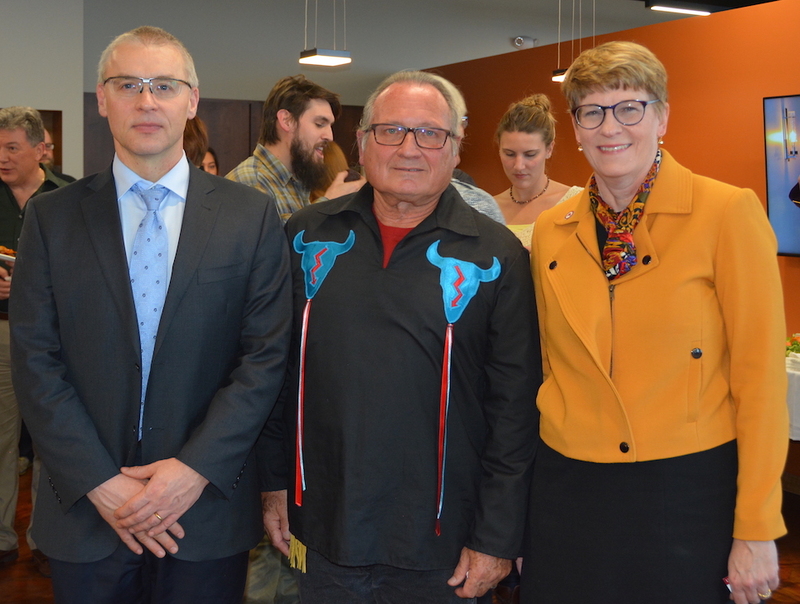 The University of Minnesota Medical School along with community members and local economic leaders, gathered today to celebrate the grand opening of the new home of the Memory Keepers Medical Discovery Team (MDT). "I see this building and our space design as a research tool," says Executive Director of Memory Keepers MDT, Dr. Neil Henderson. "The purpose of getting this together is to meet face-to-face and break out of ourselves." Located at 624 E. First St. in Duluth, Minnesota, the space was designed to showcase items culturally related to native and rural populations. From the open design concept to the medicine wheel table and the cedar walls – the location serves as a comfortable environment to collaborate and connect with the state’s native and rural communities. Supported by Governor Dayton, the Memory Keepers MDT was created to drive the state's vision for discovery to address health disparities, further elevating the University of Minnesota Medical School's position as a leader in Rural and American Indian health equity research. Rural populations are plagued by dementia and diabetes, and the MDT will develop interventions and research to meet the challenges of health disparities among people living their lives far from the resources of urban population centers. The University of Minnesota Medical School, Duluth Campus is nationally recognized as an emerging center of rural, American Indian and Indigenous health research. In 2017, U.S. News and World Report ranked the University of Minnesota Medical School 3rd in the country for Rural Medicine on its Best Medical Schools rankings. Also, the campus possesses one of the highest American Indian faculty ratios at any U.S. medical school. Our Medical Discovery Teams work to advance research and care surrounding critical issues that affect our state and will change health and health care on a global level. Through cutting-edge research and discovery, this state-funded initiative aims to address health workforce needs. Visit our website to learn more about how the University of Minnesota’s Medical Discovery Teams are tackling some of the world’s biggest health challenges.